Nukkad literally can be translated as English word “Corner”. It is basically used for a place at the end of a street (or sometimes at anywhere in the street) where people meet. Usually it is a place where a Chaiwala is there, a Paanwala is there, a garage is there, and similar places, people of various fields meet there occasionally (or even regular) and they share their little information, knowledge and sometimes just do time pass. It is a part of socialization to have such small meetings. It is the basic most form of an assembly you can say. There was a time, which I refer as the golden period for Doordarshan, which was the golden period of Indian Television too, when some great TV serials were aired. 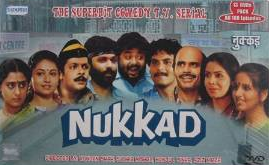 Nukkad was one of those TV serials, which gave enjoyment, entertainment and social message too, to its viewers. Viewers adore the serial too (today also). The characters played by all the lead actors were became their calling names not only those days but today also, they are better known as the characters. The quality stuff doesn’t necessary to be longer to make strong impact. Nukkad was aired for 13 episodes (like most other serials those days), and all them were quite fascinating. The first episode was about Diwali and was titled as “Happy Diwali”. People of the area are talking at a paanwala’s place about Diwali, its importance, the legend of Diwali festival and expressing their views and thoughts about the same. They were talking about Lord Shri Ram’s victory and his crowning. Some stuff about ghosts and what else. Guru found that Dhansukh brought Khopdi there. We see that Khopdi was drunk (as usual) and found near the railway line from where he brought there. He was searching desperately someone to hit. On asking he was looking for whom? Khopdi answered that he doesn’t know the name of the person as he belong to somewhere else. Actually not only some other city but a foreign country. We gotta know that he heard somewhere that Americans have asked to drop an atom-bomb on India! At the same time a bomb (of firework) blast somewhere and their talk was disturbed. Guru asked everyone that they were talking about atom-bomb and more, but why no one is thinking about the fireworks they need to arrange for the Diwali celebration. A boy in the crowd got a love signal from a girl and he got to his feet. On the incident one of the group members present a sher (a small poem like stuff). It was quite good but better you hear it while watching the show. Inspired Khopdi also present a sher and it was cool too! Guru asked Kadirbhai (Kadar bhai – the chaiwala) about the Diwali celebration plans. The paanwala asks that all them are running short at money and there seems to be no way to arrange lamps and fireworks this year. A pundit on being asked about the future (the incidents for the Diwali celebration), without doing any astrological calculation (as he was well aware with the situation and economical status of all them) forecasts that this Deewali will be no charming. Kadir sheth on this remark tells that he will not let it happen. He registers his contribution of Rs. 25 (a remarkable amount at that time, especially based on their financial condition, a very remarkable) from his side and offers free tea to all them on the day of Deewali! This is how people living in the area was good at heart. They definitely lack money but they possess the oceans of feelings and love at their heart. Kadir sheth, being a Muslim himself, initiated the major contribution for the Deewali and was keen to celebrate this Hindu festival shows that how the people were living in the brotherhood literally. The paanwala, despite of his economic situation offers the contribution of Rs. 20, a major one of course. The barber offers Rs. 25 and free shaving for all them!, even more remarkable. Guru provides Rs. 20 as the contribution and so does others. They all tried their best to provide the max they can offer. Raja offers 100 Rs. despite he doesn’t have that much money everyknow know. Though he promised to bring the amount he offered by all the means! The total contribution reaches to the figure of Rs. 200 which was a quite small amount as the previous year they were able to arrange Rs. 800. Teacherji contribute Rs. 50 from her end. Guru was telling that two major contributors Guptaji and Maneklal should not be considered this year. Teacherji asks Guru to send Radha. Teacherji then confirms her that a family fight is going on between the families of Guptaji an Maniklal and convey this message to Guru, he will then understand what to do in the matter!! What happens then? Will Guru understand the message of teacherji? Will he find a way from this details? How the Diwali will be celebrated? All these questions are better to get answered by watching the same. A remarkably simple yet enjoyable episode, I must say. All the actors know their part and they all later grow up and found their places in the industry and get appreciated for the skill they have.